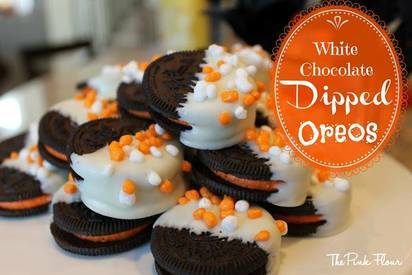 Fall themed white chocolate dipped oreos! I was walking through the store and spotted some Halloween Oreos. I always love those white fudge Oreos they have during the holidays, so I knew they would be good dipped into some white chocolate. I then topped them off with some Halloween Nerds. I wasn’t sure how I was going to like the Nerds with the Oreos, but the sour flavor was a nice contrast.